Respirators protect you from breathing pesticide contaminated air. 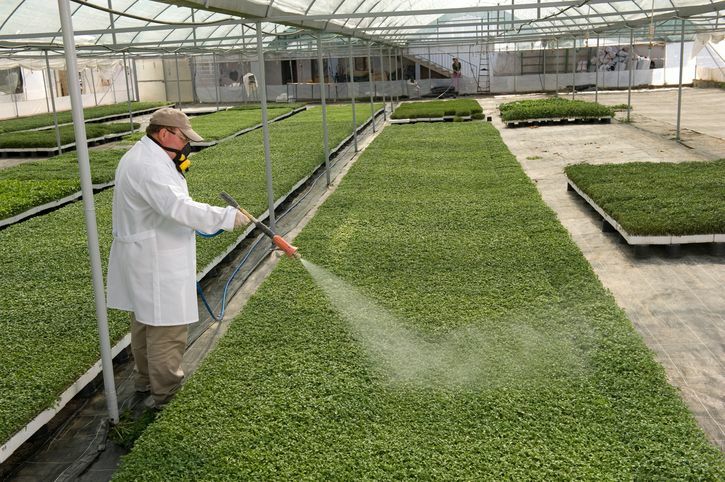 Inhalation of pesticides can be very dangerous to your health. Using the correct type of respirator, that is fitted properly, will help reduce the risk of harmful pesticide exposure. The first step in selecting a respirator is to check the pesticide product label. All labels are required by law to say if a respirator is necessary. When a respirator is required, the label will indicate what type of filter, cartridge, or canister is required. The label will also list the MSHA/NIOSH approval prefix code for the respirator. The respirator code MUST match the code on the product label! Dust/mist filtering respirators offer protection from small particles in the air. They cover the nose and mouth to filter out dusts, mists, powders, and particles. These respirators have MSHA/NIOSH approval number prefix TC-21C. Chemical cartridge respirators use cartridges that contain chemicals to remove dusts and mists and to absorb harmful vapors or gases. Chemical cartridge respirators for use with pesticides have MSHA/NIOSH approval number prefix TC-23C. This type of respirator can have either a half-face mask or a full-face mask. Powered air-purifying respirators (PAPRs) may reduce respiratory stress and heat stress. Canister respirators for use with pesticides have MSHA/NIOSH approval number prefix TC-14G. The canisters contain materials to remove dusts and mists and to absorb harmful vapors or gases. These respirators are designed to remove specific contaminants from the air. The lifespan of canister respirators is short, usually from 12 to 60 minutes, depending on size. Supplied-air respirators use long hoses to supply air to a full-face mask. Some (but not all) supplied-air respirators have a blower or compressor. The MSHA/NIOSH approval number prefix for this type of respirator is TC-19C. The self-contained breathing apparatus (SCBA) uses an oxygen tank and provides complete respiratory protection against toxic gases and oxygen deficiency. The MSHA/NIOSH approval number prefix for the SCBA is TC-13F. Follow the manufacturer’s instructions on when to replace filters, cartridges, and canisters even if you don’t notice a problem. If there are no instructions, then filters, cartridges, and canisters should be replaced at the end of each day’s work period. Always check the fit of the respirator as it should fit tightly to your face without leaks. Facial hair or beards can interfere with the sealing of the respirator. If you are wearing a respirator that filters out dusts and mists, change the filter or respirator when you find it hard to breathe through the respirator, or if your filter gets torn or damaged or very wet. If you are wearing a respirator that removes vapors and gases, change the cartridge or canister immediately if you taste or smell pesticide, or you feel the pesticide burning or stinging your nose or throat. A well maintained and properly fitted respirator that matches the pesticide product label requirements should help prevent inhalation exposure. You should still know the symptoms of pesticide poisoning in case of a malfunction.